Discover a Home That Offers Lower Energy Bills, Healthier Living Environment and Complete Peace of Mind, Guaranteed! Hi, my name is Harvey Juric. I am not a professional writer – I am a 35-year veteran home builder. However, I’d like to tell you about ICF (Insulated Concrete Form) home. A new type of home that leaves your wallet fatter and your life easier to manage. So What Are Insulated Concrete Forms? Insulated Concrete Forms (ICFs) are lightweight Styrofoam blocks or panels that are stacked on top of each other, to form the walls of a building. They look like giant “LEGO” blocks that are hollow inside. The forms are filled with steel-reinforced concrete to create a solid structure. These interlocking, expanded polystyrene molds are designed to remain as a permanent part of the wall after the concrete is poured into the cavity. The insulating capacity of expanded polystyrene coupled with the structural integrity of reinforced concrete is a powerful combination. Once you have built with ICFs or lived in an ICF home, you will undoubtedly never dream of going back to the flimsiness of a stick-framed house. The difference in quality is like comparing Niagara Falls to your backyard waterfall. These concrete homes are stronger, safer, quieter and much more energy-efficient. ICFs are the perfect replacement for concrete block, traditionally poured concrete walls, brick, framed steel or wood walls and any other typical material used in construction. It complies with all applicable building standards (Actually, it exceeds them all; by far). In fact, since 1996 The Energy Value Housing Awards in the United States and the R-2000 Awards in Canada continue to attract attention from construction industry professionals. As Insulated Concrete Form (ICF) wall-systems start to dominate these awards, the thresholds are becoming more and more demanding. In test after test, Insulated Concrete Homes are proving they are here to stay. National Energy Housing Quality Award. Canadian Home Builders Association Enviro-Home Award. EnerQuality R-2000 Environmental Excellence Award. ICF Home Stands up to 271-ton Boulder: Jack Burns of Rockville, Utah awoke to a frightening event. It seems a 271-ton boulder had crashed through the rear of his house, plowed through the bathroom, and stopped four feet from his bed. Apparently, the rock fell from the top of the butte, bounced a few times like a rubber ball, then careened into the back wall of the house and the embankment up against it, which stopped its progress. Observers measured the boulder after the fact at about 12 feet by 16 feet by 16 feet. Luckily, his home was built out of concrete using ICFs. He survived. More Than 250 Homes Burn as Wildfires Ravage Southern California: Powerful Santa Ana winds kicked up before dawn Sunday, driving two ferocious firestorms that had already burned more than 200 homes, across more lawns and rooftops. In a canyon at the edge of Claremont, about 50 homes were destroyed. 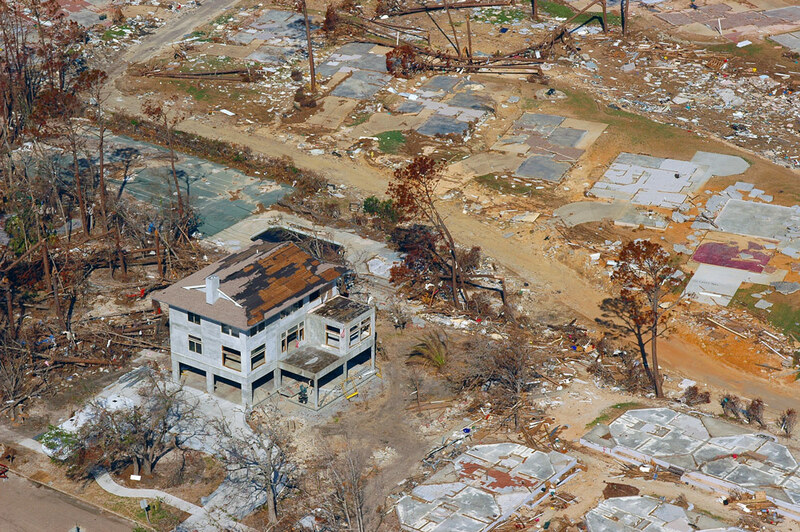 In 2005, Hurricane Katrina made history as the most devastating storm in U.S history. Pushed by 150-mph winds, a tidal surge estimated at 22 feet high swept through Alabama and Mississippi, wiping entire towns off the map. All that is left of one neighborhood outside Pass Christian, Miss., is row after row of concrete slabs—and one ICF home. It stands as a prime example of the durability of ICF construction. Houses built out of wood suffered severe hurricane damage, while homes next to them, constructed out of concrete, had much less damage. 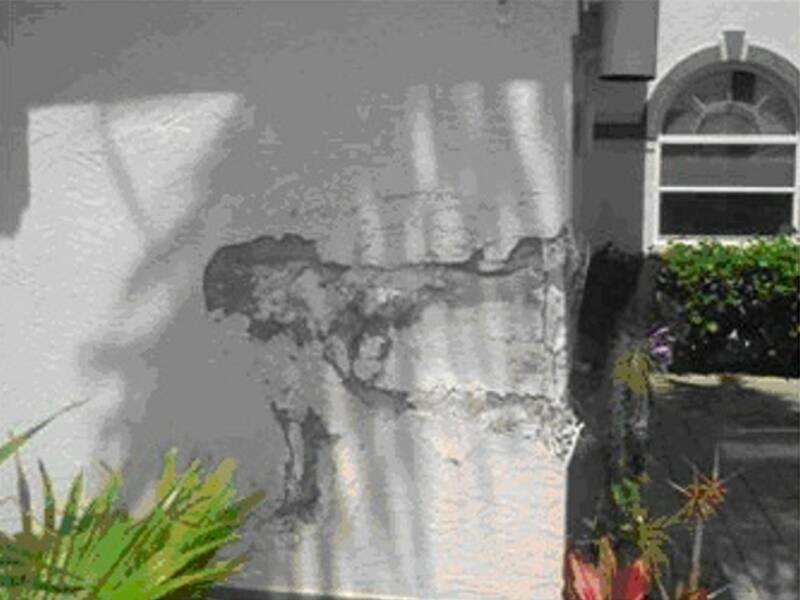 I believe the ICF wall saved my life, claims Mr. Ray Demczyk of Cape Coral, Florida. Early on the morning of June 26, 2004, as Mr. Demczyk and his wife slept inside their ICF home, a potential tragedy was unfolding outside. At approximately 2:00 A.M. an intoxicated driver was speeding down the Demczyk’s street, fell asleep at the wheel, and never noticed when his Pontiac Firebird left the road, became airborne, and slammed into the exterior wall of the Demczyk’s residence at a speed of 60 miles per hour. Stirred awake by a light thud, Mrs. Demczyk left her bedroom to identify some household object that had fallen to the floor. To her great surprise, she found a set of headlights shining through her living room window. The ICF wall’s strength was evident once the cleanup had been completed, and damage was assessed. A 3 ft x 5 ft section of the wall’s exterior finish suffered the impact of the crash while the concrete wall itself remained unscathed. Emergency workers on the scene said that the speeding vehicle would have penetrated the residence and would have gone straight through had the walls not been concrete. Even though, the car was completely totaled, thankfully, the driver survived the collision without significant injuries. The strength of the home’s walls was evident when the cleanup was completed.With that impressive demonstration of strength, the Demczyk’s chose to stay put when Hurricane Charley roared through their town less than three months later. You will enjoy a high quality and energy efficient home. You will enjoy a sound resistant home. You will enjoy much lower utility bills. Your home will last many times longer than any wood-frame house. Your home will give you peace of mind during severe weather conditions. Your home won’t have any drafts or cold spots. Your home will have high fire resistance. You will live healthier and more comfortably. No air infiltration means dust and allergens are drastically reduced. Your home won’t have any wall cavities for mold, mildew, bugs or rodents. Your home will be earthquake resistant. Your home will not mold, rot or decay. Your home may qualify for lower insurance premiums. Is Your Home Energy Efficient For The New Century? You see, I have been in construction for most of my life. From roofing to flooring I have done it all! ICFs intrigued me as far back as 1994. At that time, the industry was in its infancy, and it was a relatively expensive way to build. There were only seven manufacturers, accounting for only 0.03% of the custom home market share in North America. Advancements in technology and innovation, as well as customer loyalty and word of mouth, have rapidly propelled ICFs into a residential market phenomenon. It increased from 0.8 percent in 1998 to 2.7 percent in 2001, according to the National Association of Home Builders. Additionally, the Insulating Concrete Form Association and Portland Cement Association predict ICFs will account for more than 12 percent of the custom home residential market in 2015. There are over 50 manufacturers in North America at present. Since those years, our company has built over 120 custom homes, numerous walls, basements, and industrial projects throughout Ontario, and as far as Europe, with this new type of construction. We have also monitored the performance of these homes throughout the years. When comparing them to all available construction methods in most western countries, we categorically state that there is no better system for building homes available today! The Ultimate Custom ICF Home can look exactly like you want it to, like any other home, and it will cost almost the same money as the stick house “Bob the Builder” wants to build for you. The industry cites an extra cost of only 5%-10%, so the question “Why would you build your home out of anything else but ICFs?” is warranted. From the outside, ICF homes look the same as wood framed homes since all finishes such as stucco, brick and siding can be used. Inside, people love the thick walls that provide deep window sills for use as window seats or window display area, similar to the effect of adobe construction. Since concrete walls do not expand and contract, nail pops and drywall cracks are minimized. A home is the largest personal investment that you will make. Although complex, the process can be stressful, or it can be fun and exciting. Choosing the right home builder is the difference. So, if you are building in Ontario, you can give us a call. We will show you our selection and discuss all your options. I promise there’s no obligation or pressure of any kind. Just come into our office, have a cup of coffee, and let’s talk homes. If, on the other hand, you are reaching us from other parts of the world, please explore our website. There is an extensive collection of information and articles on all aspects of the contemporary custom home building. Enjoy!!! I look forward to helping you create your dream home. PS. : Building with ICFs results in a strong, fire-resistant, sound-proof, water-proof, wind-proof, super-insulated, extremely energy efficient, seismically superior, sustainable and environmentally friendly home that saves an average of 13 trees from the old growth forests per home. How to build the safest, strongest, healthiest and the most energy efficient home available today. Imagine warm floors on a cold winter morning: Water circulating noiselessly through space-age, durable, plastic tubing safely embedded in concrete, distributing even warmth throughout your home. Radiant floor heat will take care of that. Listen to the silence: Think of annoying neighborhood noises like fire trucks, barking dogs and early morning lawn mowers reduced to a whisper. Thick concrete walls will take care of that. Envision feeling safe: Solid concrete construction means that your home is resistant to storms, high winds, and other severe weather conditions. Just imagine your family sleeping peacefully through the noisiest of thunderstorms. Solid concrete steel reinforced wall will take care of that. Breathe the clean air: Your home designed and built with a proper air filtration and fresh air exchange system; with no noisy furnace to circulate the dust around the house. Think of how much less dusting you will have to do, or how you or someone in your family will be protected from frequent asthma attacks. Heat recovery ventilator will take care of that. Imagine heating and cooling bills being half of what you’d expect: Drafts virtually eliminated, and carbon dioxide emissions from your heating unit significantly reduced. The concrete in your walls makes an excellent “heat sponge” that stops winter temperatures cold (if you pardon the pun). Insulated concrete forms, radiant floor heating, 98% efficient on-demand water heater, and upgraded insulation will take care of that. Jump on the floor: Your grandma’s glasses set in your china cabinet will never rattle again. No matter how hard you jump on the floor. Concrete subfloor structure will take care of that. the latest and best in security measures. You will enjoy the safest, strongest, healthiest and most energy efficient home available today: Insulated Concrete Home!